As the cooler temperatures settle in for the winter, cozy up with a cup (or two) of warm Spiced Mulled Wine. 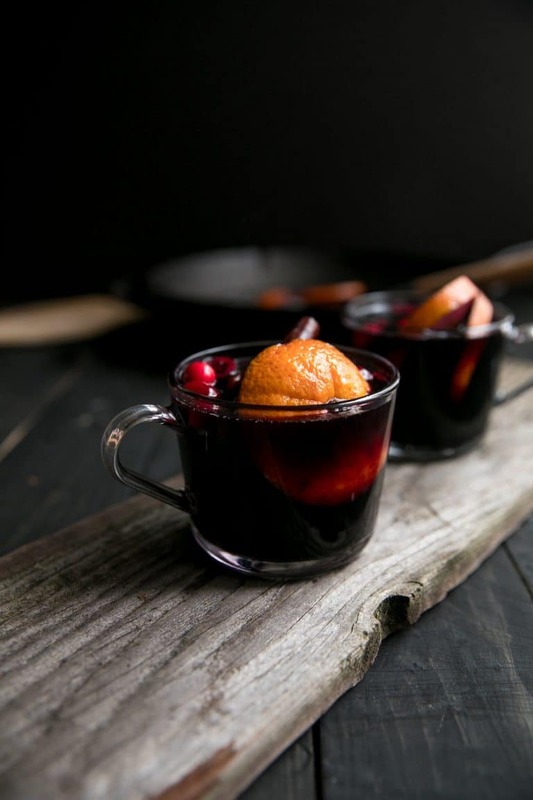 Beautiful and delicious, this Easy Mulled Wine Recipe is guaranteed to get you in the holiday spirit! 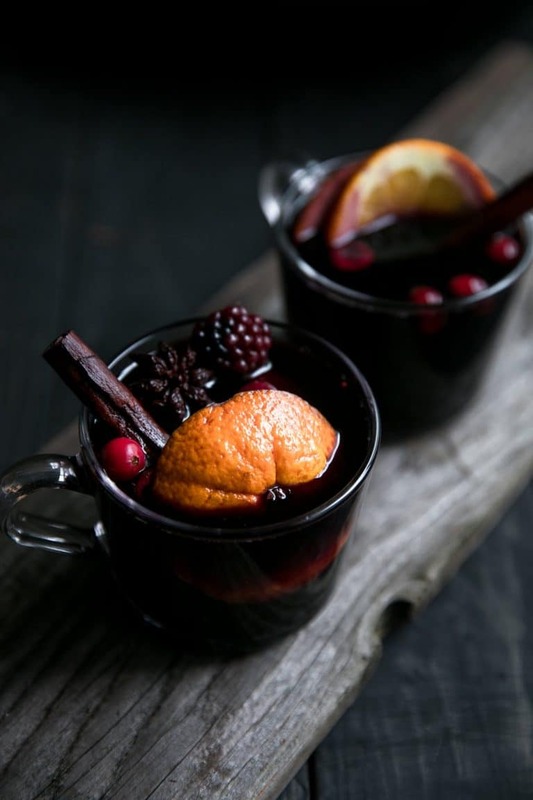 Mulled Wine, a traditional holiday beverage made with red wine and mulling spices. Delicious, cozy, and WARM, mulled wine is basically everything you want in life come Christmas time. Mulled Wine, in its simplest form, is a wine that has been spiced, sweetened, and served warm- usually with some sort of hard liquor. In Germany, mulled wine is known as Gluhwein or “glow wine” and is made with a shot of rum or amaretto. In Prague, the beautiful city where I had my first mulled wine experience, it is called svařák and while everyone in Prague has their own unique twist on this festive drink, it is most commonly served without the addition of additional liquor. Head over to Sweden and you’ll get Gløgg- a wine made with blanched almonds, raisins, cardamom, and typically more sugar. While the foundation for mulled wine is the same no matter where you go, regional difference gives each their own unique taste and flavor. Wine. Red or white, the choice is up to you. 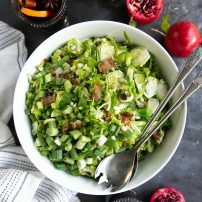 Traditionally, it is made with an inexpensive red wine. Liquor (optional). 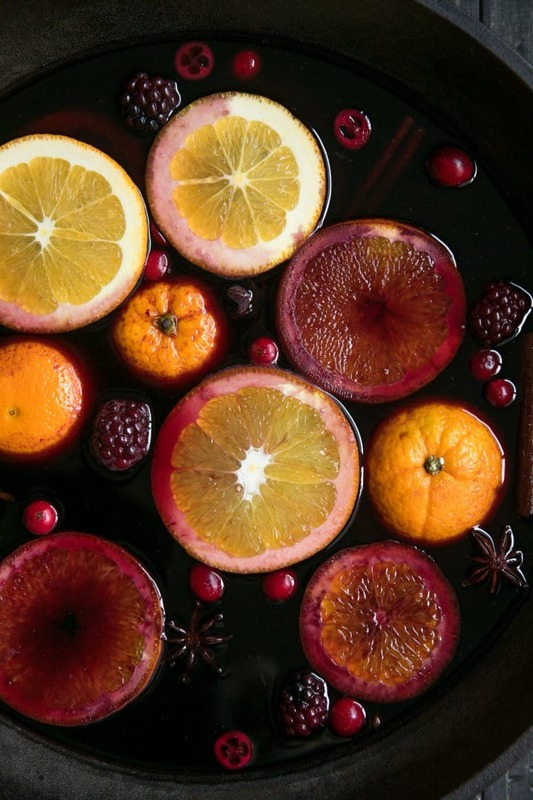 Similar to sangria who loves a little brandy, so does this mulled wine. Pick your favorite liquor- rum, vodka, brandy- or leave out altogether. Oranges. 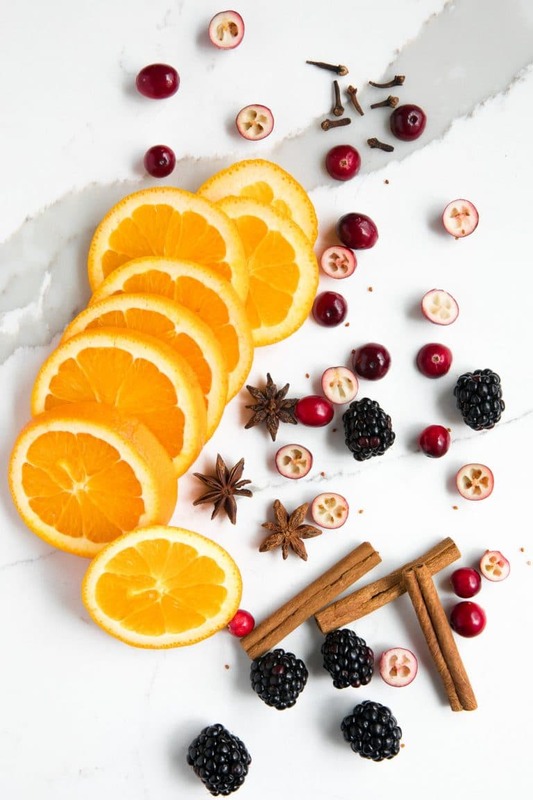 Oranges are the classic addition to mulled wine, but feel free to include clementines or lemons. Fruit. I went a little rogue with this recipe and added fresh cranberries and blackberries. The blackberries, in particular, added really nice notes of berries. Spices. Although it differs from region to region, there are three must-have spices in any warm and toasty wine (according to me)- whole cloves, star anise, and whole cinnamon sticks. Sweetener. I used maple syrup, but brown sugar, granulated sugar, or honey would also work. Of course, feel free to skip the added sugar. Is there any alcohol in Mulled Wine? Yes. Mulled wine is warm spice-infused wine. 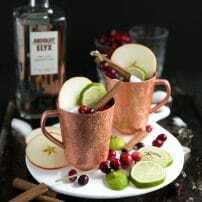 Many recipes (like this one) often include liquor like brandy, vodka, or rum, thus making mulled wine even more potent. The key to maintaining alcohol in mulled wine is to avoid boiling for prolonged periods of time. A few seconds of boiling will not boil away all the alcohol in your mulled wine; however, it’s best to keep it at a low simmer. The idea is to get the wine warm enough so that the spices and fruit can infuse into the wine, but not so warm that it starts to boil. So, moral of the story? Do not boil. Unless you want a non-alcoholic drink, in which case, boil away! Dump. Combine all ingredients in a pot or saucepan set over medium heat. Simmer. Gently bring the wine to a low simmer over medium-low heat- do not boil as this will boil off all the alcohol. Heat for approximately 15-20 minutes, stirring occasionally. Serve. To serve, carefully ladle into the desired number of serving glasses. Leave the spices behind for re-use. Garnish. Garnish with additional orange slices, blackberries, and cranberries, if desired. Make a pot of this mulled wine and you’ll soon see that there really isn’t much to it. It’s fast, easy, and people love the little bit of extra effort to make ordinary wine warm and toasty. Here are a few tips and suggestions for making the very best spiced wine recipe ever! Avoid the temptation to add a million whole cloves and ten star anise. There’s a reason why soups, stews, and yes, mulled wine, only call for a couple cinnamon sticks or whole star anise…these spices are potent. A couple of each is all you’ll need. Speaking of spices- don’t drink them and don’t eat them. Instead, leave them behind in the pot. They’re good for 2-3 more rounds of wine. I may have mentioned this already, but just in case…don’t boil your mulled wine. Add some cider! Adding apple juice or apple cider is a great way to sweeten it up without adding sugar. Start with 1 cup. Make it in a slow cooker. 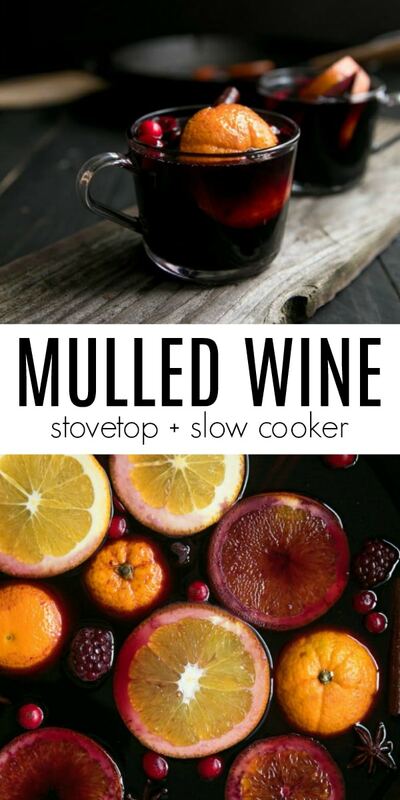 How to make Mulled Wine in the Slow Cooker? Add all ingredients to a 4-quart slow cooker. Cover and set your slow cooker to LOW. Warm for approximately 1 hour, or until wine is warm throughout. Ladle into glasses leaving behind any spices. 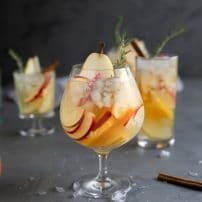 If you try this Spiced Wine, please leave me a comment and let me know! I always love to hear your thoughts. 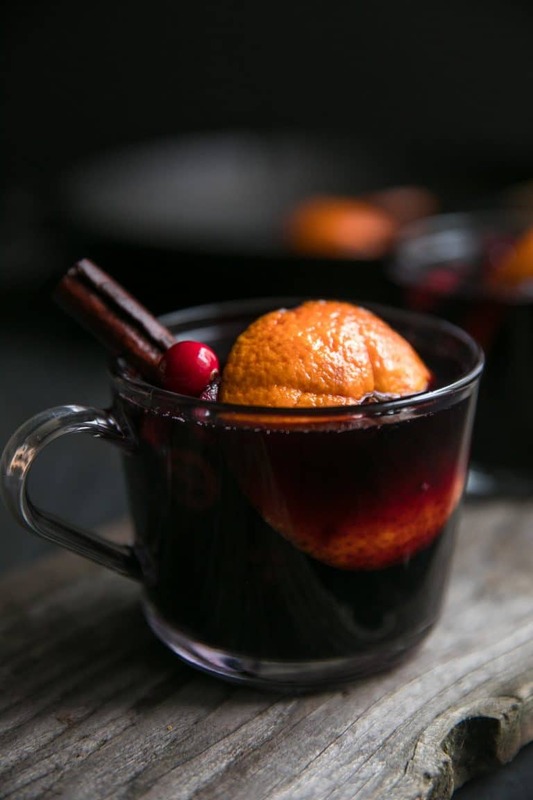 DON’T FORGET TO PIN AND SHARE THIS COZY AND CLASSIC MULLED WINE RECIPE TO SHARE WITH FRIENDS AND FAMILY THIS HOLIDAY SEASON. As the cooler temperatures settle in for the winter, cozy up with a cup (or two) of warm Spiced Mulled Wine. Combine all ingredients in a (non-aluminum) pot or saucepan set over medium heat. Gently bring the wine to a low simmer over medium-low heat- do not boil as this will boil off all the alcohol. Heat for approximately 15-20 minutes, stirring occasionally. 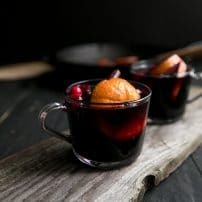 To serve, carefully ladle the mulled wine into the desired number of serving glasses, leaving spices behind for re-use. Garnish with additional orange slices, blackberries, and cranberries, if desired. 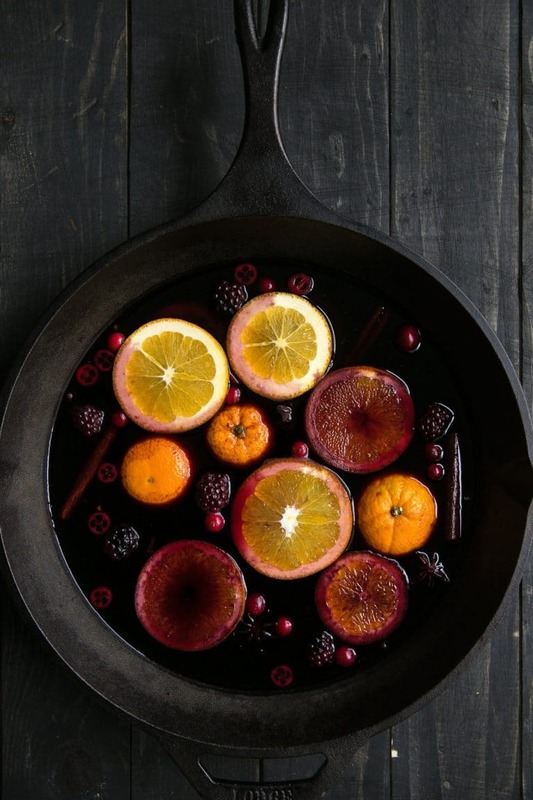 while I made my mulled wine in a cast iron skillet, I highly recommend preparing yours in a saucepan or a pan with higher sides. Cleaning red wine from carpet is no fun (even if the photos turn out really pretty).